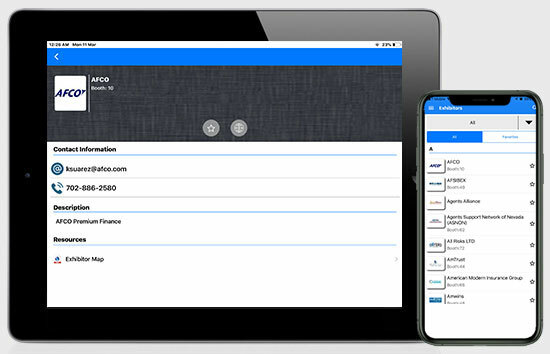 Add value to your exhibitors by listing them within the mobile event app. Show their name, location (booth number for example), logo, description, category, and website link. Connect exhibitor locations to maps so that attendees can find exhibitors by tapping on a location on a map and then jumping to the exhibitor record from there. They can also tap on the map link in the exhibitor record to see a pin falling in a certain map location that denotes the exhibitor's location. Categorize the exhibitors as featured, gold, premier, etc, or create your own category names. This adds more visibility and offers more importance to certain exhibitors. Attach document attachments such as company overviews to exhibitor records so that attendees can view and download them. Attendees can also email these documents to others. 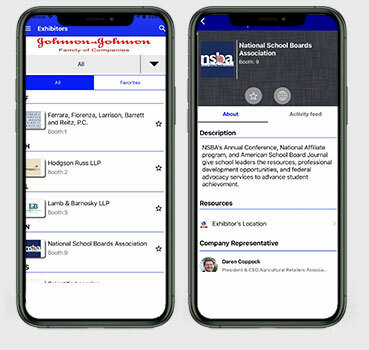 Denote certain attendees as exhibitor attendees so as to display them in the exhibitor as as well as the attendee sections of the app so that they can network with others better.